Ceiling is the place which you rarely notice but what we usually don’t realise is that it has a huge impact on every room. In fact, this is the place where you look right up when you’re about to go to sleep or when you do your sit-ups in the morning. If only you could give a redesign to your ceiling, it could be the simplest ways of giving your room a permanent face-lift. Such improvements are even sometimes good solutions for a badly stained or a cracked ceiling or even an old and dilapidated one. Redoing the ceiling of your room is also a smart way to camouflage some basic flaws in designing. Hence, if you think there’s some design flaws in your room, take into account the below mentioned ideas to redesign your ceiling and give a new look to your room. Install a ceiling medallion: Installing this is one of the easiest and quickest projects that have been designed in this article. This is also the only step that you can take on your own without the help of a professional. Although heavy and sturdy cast-plaster roundels are made for restoration work, there are some other light-weighted versions of polyurethane foam which can be easily handled. They’re used to draw attention to chandeliers and to enhance molding or simply liven up a place ceiling. If you want to attach a ceiling medallion, you have to apply a urethane adhesive to the item and soon place it at the desired location. Secure the medallion with enough screws. Pressed tin panel: Over the last decade, pressed tin panels have become immensely popular. Although their metal sheets with patterns usually complement old homes or lofty apartments, yet there is a folksy feel around them that may suit a modern interior as well. However, make sure you don’t install it in a room where quality is the most vital imperative for the person staying in the room. You will need help while installing the panels as they usually weigh up to 4 lbs. Attach wallpapers: Attaching wallpapers to the ceiling can be yet another tricky idea of enhancing the look of your ceiling. There are indeed endless designing possibilities with the extreme popularity of wallpapers. Choose an appropriate wallpaper in accordance with the size, shape and color of your room and make sure the main features of your room gets enough attention even after installing the wallpaper. If you wish the room was larger or smaller, play with the colors of the wallpaper that you choose. Layered drywall: In open floor plans, the boundaries between dining and living areas are usually tough to differentiate. Thus, applying a simple border of drywall to the ceiling can easily stress and emphasize on each area and also boost the architectural impact without even blocking light. This technique usually comes in rectangular shape. 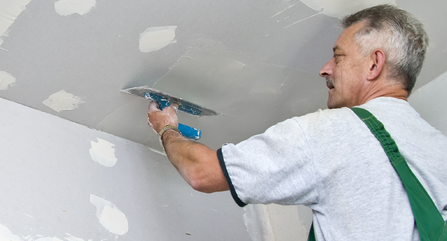 Hence, if you’re looking for ceiling repair Perth ideas, you may take into account the above mentioned points. Get help from a professional interior decorator if you fall short of smart ideas.